IT&T spent a great deal of money between 1928 and 1935 attempting to bring the former Mackay Companies, acquired from Clarence Mackay, up to a standard that would give them a competitive edge over their only real competition, Western Union. The old Postal System, known as the Mackay System, had two main units: the "Land Line System" with a domestic telegraph business, and a cable and radio system to Europe and Latin America. Under IT&T management Postal persuaded the telephone companies to handle its telegrams on the same basis as Western Union's: charged to the customer's telephone bill. It arranged with several Standard Oil Companies to have filling stations accept messages. It developed its radio business, modernized transmission equipment, spruced up its messenger boys. It sought additional revenues in the distribution of bus, theater and airline tickets. All this additional effort increased Postal's share of the available telegraph business from 17% to 22%. But the company did not thrive. Deficits were reported in 1931, 32, 33 and 34 and interest charges on $50,000,000 of bonds and debenture stock were only met by liquidating assets and borrowing from IT&T. In mid-June 1935, facing another interest payment on July 1st, Postal's President George S. Gibbs petitioned the courts to reorganize under Section 77 B of the Bankruptcy Act. 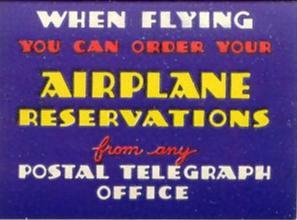 Postal's problem was not unlike that of many a common carrier. Its' annual revenues, in 1935 about $28,000,000, were not sufficient to meet fixed charges after paying all expenses. The bondholders had to take at least a temporary cut in their coupon rate, and the preferred stockholders, who had no return for the preceding four years, were asked to accept a less preferred position in the capital structure. The knottiest question at the time was what would happen to the common-stock, all owned by IT&T. The Behn brothers not only issued more than 300,000 shares of IT&T stock to Clarence Mackay and his associates in payment for Postal, but IT&T also subsequently increased Postal's equity by $25,000,000 in cash which was used to finance Postal improvements. Mr. Mackay did not fare much better than the Behns. The value of his immense IT&T holdings melted like snow when the price dropped from a 1929 high of $149 per share to a Depression low of $2.63. Not long after that low was reached (ca. 1932), the Mackays were living in his estate Superintendent's house on his Long Island estate, having been forced to close the mansion and to drastically reduce or stop altogether the wages of his 100 plus gardeners, grooms and domestics. Click here for a view of the DJIA during this time. By early February 1940, and after 4 1/2 years of reorganization, the remains of Mr. Mackay's communication system emerged from bankruptcy. The result was two new companies. 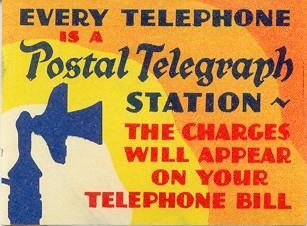 Postal Telegraph, Inc. got the land lines and American Cable & Radio Corporation (A.C.&R. ), a holding company, got the radio and cable lines (including IT&T's South American radio properties). Two-thirds of A.C.&R. was owned by IT&T, one-third by bondholders in the old Postal. Traffic contracts linked Postal's land lines to the international network. As for the new Postal, it was now free of IT&T control, owned by its former bondholders. In exchange for its cable and radio properties to A.C.&R. these former bondholders also acquired first call on A.C.&R. 's earnings in the form of $9,210,632 of its subsidiaries' debentures. Another $3,293,562 of debentures went to IT&T. What old Postal (or IT&T) bondholders got out of the deal depended on A.C&R. 's subsidiaries. At an earnings level before interest and taxes of around $1,500,000 (about 30% above their combined earnings for 1939) IT&T's two-third stock interest in A.C.&R. gave it a better return than Postal bondholders, who had the larger bond interest. As for the Postal bondholders in the new Postal, what they got depended on whether the land lines could work a miracle and stay out of the red. Main obstacle: a big competitor, Western Union. Western Union had lean years too, the amount of business (badly nicked by telephone and airmail competition) could not support two profitable systems. President of the new Postal was a tall, smooth ex-accountant named Edwin F. Chinkund, who twice in his career had been a partner in Arthur Anderson & Co. (auditors), in between was vice president and comptroller of IT&T. His immediate job was to compete more aggresively with big, hungry Western Union. But the long and more complicated end of his assignment was in negotiating with Western Union, investors, labor and Washington for a merger of the two sickish systems into one with a better chance of making money. In 1943, Chinkund succeeded, Postal merged into Western Union. The 57 year old company begun by John W. Mackay in 1886 ceased to exist. The Commercial Cable Company and the Mackay Radio Company lived on in A.C.&R. until technology eventually passed them by too. dated April 2, 1928, June 24, 1935 and February 15, 1940.